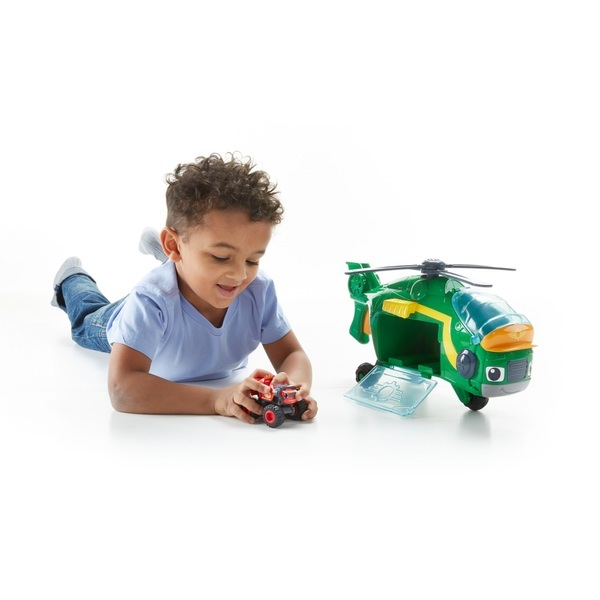 Monster Machines Monster Copter Swoops is Blaze's newest friend. Monster Machines Monster Copter Swoops helps Blaze to get to the Velocityville speedway and fast. Swoops is a high-flying Monster Machine transporter and Blaze is in the cockpit ready to pilot this soaring copter. Swoops can store an additional two Monster Machines in his cargo bay so Blaze can bring other friends to Velocityville too! (Other vehicles sold separately )The translucent side door and cockpit window allow you to see the trucks as Swoops takes Blaze and the Monster Machines on an adventure beyond Axle City! Squeeze the trigger on the handle to spin the propeller, and then open the cargo bay doors as Blaze and friends are ready to roll out and race!